Latest information about the death of an Iraqi journalist who was investigating the activities of the death squads in Iraq, shows he was shot with his hands up in a scene which resembles an assassination zone. Knight-Ridder reporter, Yasser Salihee, 30, was killed on June 24, 2005 while on his for gasoline to bring his family to the swimming pool. He came into a Baghdad road intersection where every exit had been blocked by U.S. Humvees. He died of a single shot to the head. A propaganda report by Salon.com, which interviews the supposed sniper --but does not identify him-- paints the incident as an unpremiditated, accidental killing. But details of the scene and the events now revealed have the hallmarks of a staged assassination. At the time Salihee entered the intersection, all other exits were blocked. And as he approached, another car already in place began 'turning' in front of Salihee to bring him to a halt in the killing zone and ensure a perfect shot. 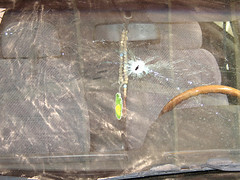 The windshield of his car appears to be pierced by only one bullet -the fatal one. Four fingers of his right hand were missing -possibly in vain self-defense. Yasser Salihee was an Iraqi journalist. Joe was an American sniper. On June 24, 2005, fate brought them together on a Baghdad street. ...Falah Hassan Jasim, a plumber who was standing on the south side of the street when the shooting happened, told me, "There was a Lada car turning in the road and he [Salihee] tried to pass it, and then he pulled over. The Americans shot him, they were standing in the middle of the street." According to Hassan, Salihee was stopped with his hands up when the snipers fired at him. I asked Hassan about the interval between the shots and he said, "It was like this, pop, pop, pop," saying the bullets were fired in less than a few seconds. Another witness, Hamid Mohammed Aboud, a 25-year-old ice seller who works at the corner of Amel Al Shabi and Rafaee streets, said, "Both Americans were firing at the same time, the shots were very close together." Was Salihee's car stopped? There does not appear to be definitive proof one way or the other. Ayman Salihee, Yasser's younger brother, said that when he arrived at the intersection, he saw that the Espero's transmission was in neutral and that his brother's feet were on the brake. In the police report, a diagram shows that Salihee's car was pulled all the way over to the left side of the street, parallel to the curb. The evidence suggests that Salihee might have had his hands raised. Four fingers on Salihee's right hand were missing. Although it's possible that a bullet other than the fatal bullet caused the injury (there were conflicting stories that an Iraqi soldier might also have fired), the missing fingers and the angle of fire are consistent with a bullet striking a raised hand. The details may be murky, but in retrospect it is fairly clear what happened. The real problem was that the platoon did not put out cones and wire -- if they had Yasser would have stopped. Then came the fateful turning car, followed by another car coming around it. The soldiers were on edge, but they seem to have followed their rules of engagement. It was a typical misunderstanding, of the sort that happens all the time in Iraq. Did you actually READ Mr. Robertson's article published by Salon? He clearly states that Mr. Salihee was his translator's brother, a colleague and a friend. Mr. Robertson tracked down that sniper at the risk of his career (and possibly his life) in order to find out what really happened. He clearly did not believe the story that the sniper shot in self defense (which is what the military claims.) He could not reveal the sniper's name for many obvious reasons: one being that it would put his own life and that of his translator (Yasser's younger brother) at risk, another being that it would put an immediate end to his career. The small good that publishing that name would do, would be outweighed by the loss of one of the best independent voices on the ground in Iraq, and the sniper would never be punished in the end anyway. Mr. Robertson did what he could to honor the memory of his friend by getting the story out there, for his sake, for his family's sake and for the sake of every person "accidently" killed by the panicky, under-trained and overworked kids they call an army. Mr. Robertson got that sniper to question his own justification for shooting Mr. Salihee. He made the kid understand that Mr. Salihee was a good man with a family. That soldier must live with that knowledge for the rest of his life. Every soldier that reads that article will have to think about their own actions too. If it makes one soldier THINK before he pulls the trigger, then Mr. Robertson has done a great thing. Your idea of a "staged assassination" goes beyond conspiracy theory and crosses the line into gross negligence and puts reporters lives in jeopardy. In a place already rife with conspiracies the last thing the western _independent_ reporters need is for the Iraqi people to be given "proof" that they are somehow part of a military conspiracy. Since you consider yourself to be an actual "news source" you should also print a proper retraction. On the other hand, if you admit that you are just an irresponsible conspiracy hack, then I suppose you might not care what happens to journalists in the field and think you are unaccountable.